The last grand tour of my Highland Fling is history. The day trip to Oban was the warm-up, but the two great, long days in a row, the first to Skye, the second to the Orkneys. were the highlights of the highlands. I’ve already noted the giddiness I experienced on Skye, and the sense of history, even pre-history, I felt in the Orkneys. Such days are rare even for one who, like me searches for such experiences every time I travel. So! How to come down from the highlands? Physically it was a gradual descent. 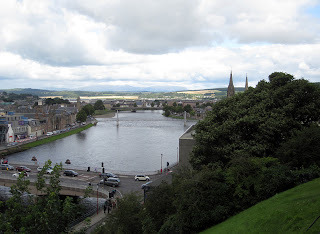 On Wednesday, as planned, I spent in a more relaxed manner, getting to know more about Inverness, a town I have come to enjoy more every day I spend there. I started out walking up the River Ness in the direction I’d not yet traveled. 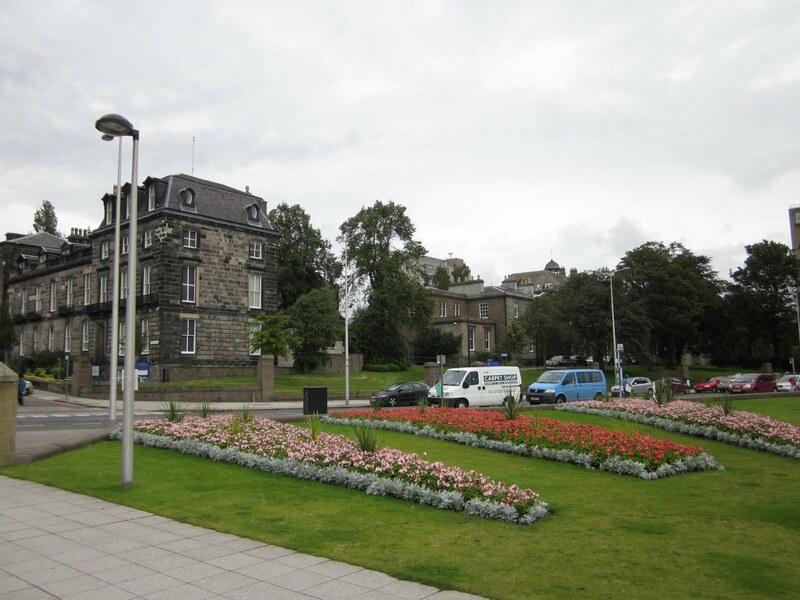 I passed the University, which is located very near to my hotel, then some athletic fields, and then on to the islands of the River Ness. This is one beautiful park! As the river widens, several tiny islands come into view. The city has very smartly placed charming little bridges in that area, so that one can get from one side of the river to the other, but by a meandering route on paths through trees and small streams. Except for the bridges the area seems to be a natural wonder, but I began to notice strings of lights in places, and also a few floodlights. This makes the islands less than completely natural, but also accessible by night as well as day, a very well set up park in the city. As I was walking, so were many others, mothers with prams, businessmen, serious walkers and joggers. You’d never know you were only a few blocks from downtown. Every city should have such a park, but then every city should have a river as lovely as the River Ness coursing through it. After exploring the islands I visited the castle, which is mostly a police court these days. I remained outside, but the height on which it sits provides great views of the city. 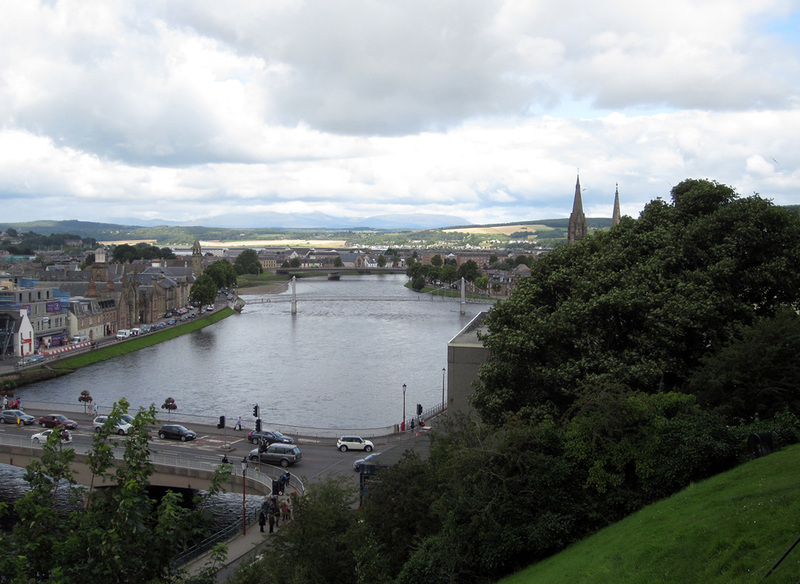 Just down from the castle is the city museum, which is a very user-friendly, simple and quite informative look at Inverness and the surrounding highlands from pre-history to the twentieth century. Just one of many examples: you can press a button and hear how to pronounce Gaelic words, such as the popular toast, “Slainte,” one I’ve always feared to offer, as I am not sure how to say it. And I must admit that writing now, not two days later I have already forgotten, but that’s down to my memory or lack thereof, and not the clever device set up at the museum. While we’re pronouncing, I’ll remind you of what I found out from Joe the driver on the Skye trip; that the Scots pronounce “Gaelic” “gal-ic,” not “gay-lic” as the Irish say it. Then back to the hotel to write. I have been struggling to keep up the blog, and to post accompanying photos. I’ve taken hundreds of snapshots since my fling began, and I insist on photo-shopping them to the best of my meager abilities before putting them up for public display, so I’ve been quite busy when not out flinging chronicling said flinging. It’s good for me to write as close to the experience as possible, as whether I like it or not, my memory is not what it used to be, alas and alack, hey nonny, too friggin’ bad, but there you have it. 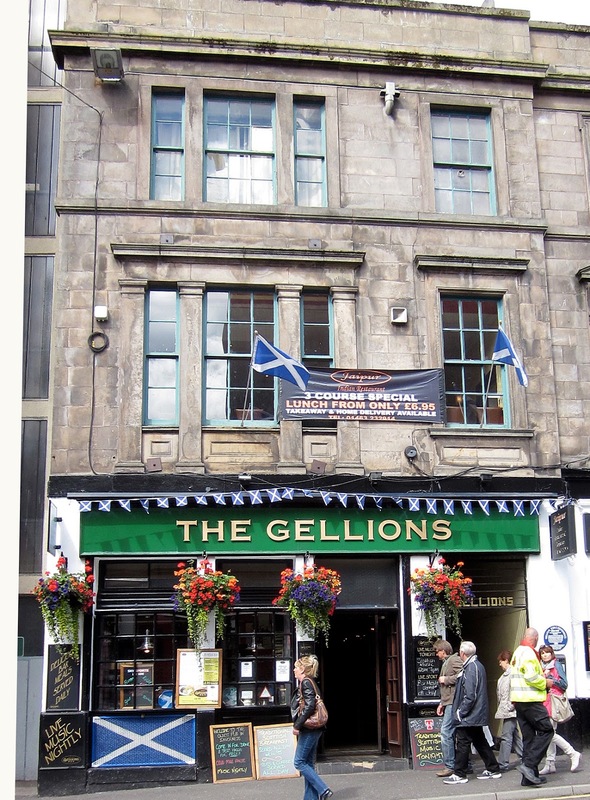 I decided to cap off my highland adventure with a little traditional music at one of the oldest pubs in Inverness, The Gellion’s, a tiny place that promises such music nightly. I ordered, sat at a small raised table, and ate a modest dinner washed down with a tasty ale, whose name alas I’ve forgotten – ah, memory! The musical duo seemed modest at first, two kids barely out of their teens, the lad a fair guitarist, the lass a surprisingly fine fiddler. They spoke not a word, and she giggled occasionally when she got a fancy passage right, but their music was fresh, enthusiastic and joyful, all I could ask for on my last evening in the highlands. As I left I gave the lass a thumbs up and she flashed me a broad smile and returned it! 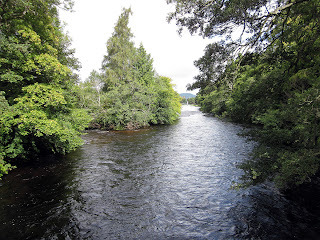 The next morning (this brings us to yesterday, 18 August) in a light rain I hastened to the train, caught it, and headed down from the highlands. You could see them disappear with each stop – fare thee well! I changed trains at Perth and 20 minutes later arrived at the lowlands city of Dundee. I chose it almost solely because it was an hour’s train ride from Edinburgh, so that today’s trip would not be at all taxing, but it turned out to be a nice surprise. It’s hardly a tourist mecca, but it is a university town as my taxi driver proudly observed, boasting 23,000 students. He told me it was less expensive than other college towns in the U.K. and apparently very protective of and welcoming to its students, a proper melding of town and gown. On a side (and sad) note, British university prices are set to soar next year, from about 3,000 GPB to as high as 9,000. Students have protested kingdom-wide, last spring rather violently in Westminster. BBC news is filled with stories of A-levels, exams in different subjects which are much of the basis for getting in to university. This year, passing you’re A-levels with flying colors is more important than ever, as it’ the last year students will be accepted at the lower tuition rate. Just this morning there was an interview with two that did not attain the grades needed, and the distress was clearly evident. Rightly so with that very steep increase. Back to Dundee. 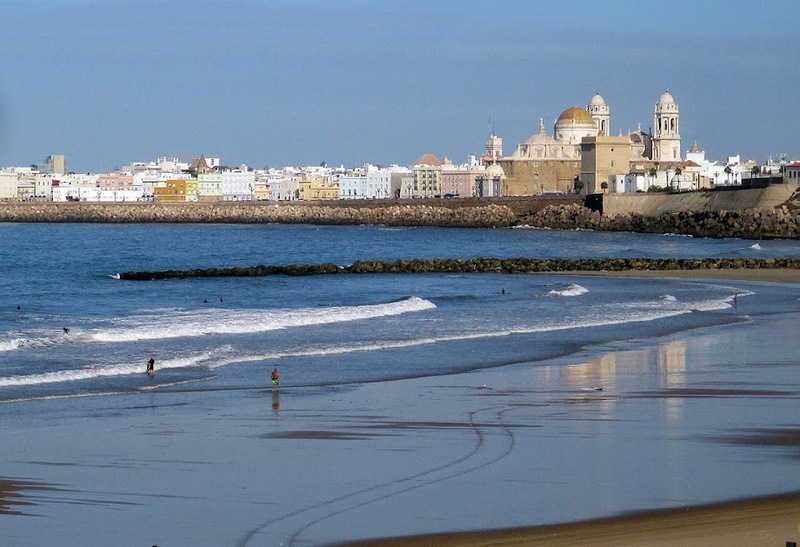 I walked to the city center, nearly a half hour brisk walk from my hotel, but I needed the exercise, and though the clouds lowered no rain fell. I bought a very light jacket with a hood, something I’ve done without for many years of coming to the U.K. but that I’ll surely find useful, maybe even in the next few days at Edinburgh. I got it in a store that announced a “final sale – everything must go,” though it didn’t look as if the store was going anywhere. The price wasn’t bad, and I also picked up a compass, as I’d lost mine shortly after arriving in the U.K. In an era of smart phones equipped with gps that may seem hopelessly old-fashioned, but it comes in very useful when I don’t know whether I’m walking north or south. And I continued my search for the perfest Harris Tweed cap, still to no avail. Does it await me in Edinburgh? Stay tuned. After about two and one-half hours I headed back to the hotel. 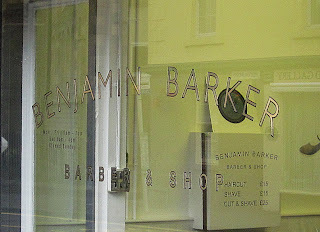 While walking I discovered the brilliantly named hair parlour: Benjamin Barker: Barber and Shop! If you’re a fan of nineteenth century penny-dreadfuls or of Stephen Sondheim you will recognized the name of a man aka Sweeney Todd! When I got back to the hotel I posted my find on facebook and got inundated with responses – what can I tell you? I live among a theatrical tribe! After the post I wrote more for Dottore Gianni’s blog (somebody bloody has to! ), and napped a bit. Then went to dinner at a place recommended by the hotel, the Don Michael Italian restaurant. It wasn’t as good as recommended, but it wasn’t bad, and the proprietor brought me a small limoncello as a treat at the end – warmish rather than fresh and chilled from the freezer, but still, it’s the thought that counts. All in all a fine evening. I turned back to the hotel, but thought the better of it and went back the other way, in search of Sweeney Todd, er Benjamin Barker. 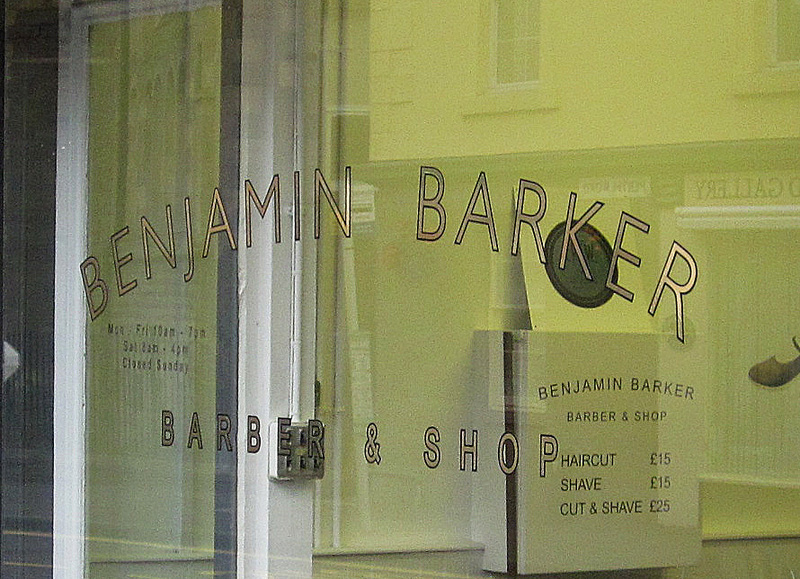 Found it still open, and “Benjamin” working on a customer – hair and beard only, I hoped! I surreptitiously snapped a photo, returned to the hotel (the Shaftesbury, a friendly establishment and a pleasant place to spend a night or so), posted the photo on facebook and got even more response. Now it’s the next morning and I’m writing again, the very last post of Dottore Gianni’s Highland Fling, and thinking again about coming down from the highlands. Physically I am very much in the lowlands, but I never want to lose the inimitable high I discovered, breathlessly, in the highlands of Scotland.